A meditative style of yoga used to build strength and alignment by holding poses for extended periods of time. This style of yoga is great for practitioners of all levels! 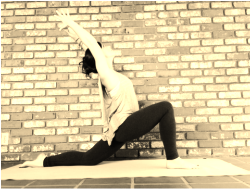 Vinyasa yoga links breath and movement to create a dynamic style of yoga. Poses are typically linked in a flowing sequence and allows practitioners to build their strength and balance while focusing on the breath. works by relying on the synced movements of another individual. Yin Yoga postures are more passive postures, typically practiced seated. Yin Yoga is unique in that you are asked to relax in the posture, soften the muscle and move closer to the bone. While yang-like yoga practices are more superficial, Yin offers a much deeper access to the body. It is most common to hold postures for three to five minutes. The time spent in these postures is much like time spent in meditation.